A colleague of mine has just had a new article published in the journal Brain Research (I'm third author on this paper). The study looks at patients with Focal Cortical Dysplasia, a medical condition that predisposes the patient to developing epilepsy. Our work looked at a large collection of brain MRI examinations of patients with Focal Cortical Dysplasia and compared them with a pool of typically developing participants. Last year I published an article in the excellent journal Human Brain Mapping that analyzes a huge population of patients across a wide range of developmental ages who received clinical imaging at Boston Children's Hospital. You can check out the article here. I recently published a preliminary study on stroke imaging at the International Symposium on Magnetic Resonance in Medicine (ISMRM), the main MRI researchers' conference which was held in Milan, Italy. I've just had an article published in the journal Radiology focusing on the mortality/survivorship results of MRI-enabled breast cancer screening. It takes a very long time to acquire mortality/survivorship data in a breast cancer screening study. Typically a population is followed for a long time (often more than 10 years) in order to establish what percentage of women who develop breast cancer go on to survive the disease many years after a diagnosis from the screening method being tested. I recently published an article with the journal Academic Radiology. The paper presents a method for assessing a tumour's margin towards the detection of breast cancer from state-of-the-art MRI examinations. Malignant margins tend to appear diffuse and variable by virtue of cancerous lesions being characterized by invading into neighbouring tissues. Margin measurements also have potential applications in the assessment of whether a lumpectomy (removing a lesion via surgery) actually successfully removed the entire tissue of interest, however, this article is focused on using the margin measurement towards a more accurate diagnosis of breast cancer from MRI examinations. Chutzpah is a Yiddish word meaning: impressive cheekiness, brash, informal shameless audacity. Theoretical physicists regularly disagree regarding how many dimensions exist in the universe. Some put it at 10 or 11 or 13 dimensions but no one really knows how many dimensions exist in the universe. Some theoretical physicists can be quite passionate about their particular belief in the total number dimensions in the universe even though they know that they don't know what the truth is regarding the true number of dimensions. There is a lot of confusion among scientists regarding the appropriate use of statistics. A recent short letter on statistics published in the Canadian Medical Association Journal (CMAJ) helps illustrate this problem. CMAJ does not take out a copyright on the letters so we're reproducing it here, although you can access it directly from their website. Mistakes are part of the nature of scientific research. The Huffington post recently published an article by a medical doctor on the greatness of thermography as a mechanism for breast cancer detection, you can access it here. Article on a new statistical machine learning technique recently published and presented. The technique's abilities have been demonstrated in breast cancer detection from state-of-the-art MRI examinations. A short article on peculiar personal effects of September 11th and an interesting technical conference in Argentina. A funny personal anecdote on food, communal living and multiculturalism. Humorous Aside: What's new pussycat? I recently read in the news (the globe and mail) that in Indonesia they have a delicacy called Kopi Luwak which is a special kind of coffee prized for its smoothness. It was recently discovered that this website comes pre-censored in China. The website is hosted by Google's free service which apparently has long been censored in China. It would seem that the Chinese Communist government doesn't like it that anyone can create a website in this space and write anything they want! An article on the peculiarities of the ways we create money. 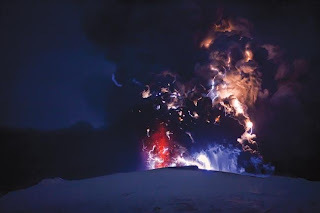 When volcanos erupt it lets off a bunch of gases into the atmosphere. A big volcanic eruption can actually cause global cooling - light waves that would otherwise have reached the earth's surface and caused some warming were instead deflected by particles in the atmosphere put up there by the volcanic eruption. When we burn some fuel, greenhouse gases are emitted which are known to act as an insulator for the earth (helping us to stay warm by retaining heat). A short point on obvious shortcomings at the United Nations. How much climate change is connected with the solar cycle length? There is a big controversy in climate science regarding the magnitude of the effect of solar variations on the earth's climate. This article discusses one of those controversial theories. From a US Statistical Abstract: there are about 75 million homes in America with about 48 million mortgages. At an average value of just over $100,000 the total amount of money borrowed in the form of mortgages is 5.4 trillion dollars. Fighting climate change is thought to be important because if we don't then some regions may produce less food and water in the future and more people will die from starvation and dehydration. No one wants starvation and dehydration to get worse. Currently we spend about 3.7 billion dollars a year trying to feed the world through the UN World Food Programme. It was recently announced that the U.S. would commit to a climate change fighting plan which involves (eventually) contributing 100 billion dollars per year to dealing with the problem. I’ve heard that the world produces enough food to feed everyone. Unfortunately there are 1 billion malnourished people in the world today (according to the UN World Food Programme). The following article presents a quick rough estimate of food waste and compares it with how much food might be needed for the world’s malnourished people. The dangers climate change presents can be described as follows: if in the future the world is significantly hotter then some regions may not produce as much food or water as they currently do and this can lead to drought, starvation and dehydration. Furthermore, many scientists have pointed out that climate change is likely to cause more episodes of extreme weather conditions. Extreme weather patterns (like say a tsunami or hurricane) can appear quite quickly and can have devastating effects on the local population’s ability to feed itself. This is all the more poignant in poor countries where the local populations tend to lack adequate financial resources. Today in the news it was announced by Hillary Clinton (secretary of state for the Obama administration) that 100 billion dollars per year was what the Americans were offering as part of a multinational deal to help fight climate change. When the economy got bad and the Canadian bank's bottom lines started looking slim they decided to steal from their customers! Many of the main banks raised the interest rates they charge on their customers in unison early this year (which is probably an example of a violation of collusion laws). The banks decided to blindly steal from everyone right when the economy was worsening and many people really were struggling. Physics attempts to explain the universe around us. The universe is broken down into explainable equations and relationships based on a few basic principles that attempt to explain the nature of the universe. In standard physics, explaining the universe has typically been limited to explaining matter (and the fundamental forces that govern their interactions). Very few attempts have been made that try to incorporate other known natural phenomena of the universe - like consciousness - into a mathematical or physical model of the universe. I have never heard a convincing explanation for the phenomenon of consciousness that is based purely on our understanding of matter and the fundamental forces that govern matter's interaction. A short wishful article on the need for larger scale charitable integration with existing capitalism. The Far Side is a great comic! You can check it out here. I collected a few of my favorites below. Homosexuality has been observed throughout the animal kingdom. Everything from elephants to dolphins to birds have been observed engaging in homosexual behaviour. There is plenty of evidence for the existence of genes that predispose the carrier to homosexuality. From an obvious Darwin - pass on your genes perspective being gay (thus probably/possibly having a pair of recessive gay genes) would not seem like a winning combination for the mere passing on of one's genes. This is one of the main reason based arguments against the naturalness of homosexuality - others don't accept it because of the dogma of some old text (such as the bible). However, homosexuality is observed throughout the animal kingdom thus is quite natural and normal. A professor is a nice cushy job - assuming one has tenure. The following cartoon from PhDComics.com compares a professor with a most unusual alternative career path. Humorous Aside: Paid too little to lose one's job? Some funny comics from PhDComics.com. Some funny cartoons from PhDComics.com on entering the post-doctoral research phase of academia. Buddhism is often referred to as a science of the mind, where principles are accepted or rejected based on the mental reactions they elicit in the practitioner. Principles are also accepted or rejected based on the perception of how closely and accurately they reflect the teachings of Siddhartha Gautama (the historical Buddha who lived ~2500 years ago on the Indian Subcontinent). By personal experience I would say that the correct application of logic is inclined to elicit a positive mental reaction in the practitioner. Reason can be used to support the concept of predestiny, an example of which is demonstrated as follows: What happened in our past was fixed (the thoughts we had, the actions we took etc.). In the present we can choose to do this or that but go a moment into the future and we can look back at what we just called the present and see that we chose to do one particular thing in that moment. Thus although we supposedly have a choice in the present, there is only one thing in the present that we are actually going to choose to do. Thus it would appear that all our choices/actions were/are predestined. Einstein has blessed us with a huge quantity of scientific contributions. I'm a huge fan of the ideas he was presenting with relativity. He has also furthered our understanding of some of the properties of light. However, Einstein also said some strange things regarding the energy of light in trying to explain the photoelectric effect. It is known that cancerous tumours tend to exhibit acidic pH levels. In fact the urine of patients with advanced cancer can be extremely acidic. It is plausible that the acidity of cancerous tissues is detectable via MRI when the tumour is still very small. The Dalai Lama (the spiritual leader of Tibetan Buddhism and one of the world’s most prominent Buddhists) has indicated that he believes that Buddhism is ready for scientific analysis in the age of reason. I agree with this assessment – indeed I believe all the world’s religions need to be ready for scrutiny and analysis in the age of reason. To this end the Dalai Lama has indicated that Buddhist scriptures disproved by modern science should be abandoned. I was thinking about how some ideas from science may conflict with the idea of impermanence which plays a moderately prominent role in some Buddhist texts. One example may be whether matter as we know it is permanent or impermanent. Science and technology can play a big role in facilitating people's free speech and in turn assisting in world peace. String theorists claim that the universe has 9, 10, 11, 13 or whatever number of dimensions (depending on which theorist you talk to). These claims are based on nothing more than mathematics, however, I wouldn’t be surprised to discover that the universe does indeed have more dimensions than the 4 dimensional space-time that Einstein’s general relativity implies. Problems with the Bohr model of the atom: it claims that the reason the electron does not degrade and collapse into the nucleus is because the electromagnetic force pulling the electron in is balanced by the centripetal force from the kinetic energy of the electron (moving really really fast around the core). The problem with this model is that maintaining its super fast speed is the only thing that keeps the electron from degrading into the nucleus and letting off a LOT of energy (Einstein's E=mc^2). The universe has been around for some 14 billion years, I think matter is a little more stable than that! Science and technology have been advancing at a remarkable pace. One large contribution to changing our lives is the cell phone - not least of which because modern versions have the ability to take photographs and capture video clips. Some jokes from PhDComics.com on keeping realistic thesis expectations. Functional MRI is an exciting idea: it allows us to create a map of how the brain responds when the person being imaged is subjected to some particular stimuli (say being shown a picture or told to perform a task). Functional MRI (fMRI) involves taking a measure of the amount of oxygen in a particular location of brain tissue. When a person’s mind activates with a particular thought/concept/action the activation can be measured by observing an increase in the amount of oxygen present (oxygen is delivered to activating regions by hemoglobin). We all have the ability to use our memories to look back at past events. If we were to do so we would be aware that at one particular point in our past we chose to do some particular thing. In the present moment, free will implies that we have the ability to choose to do any particular thing. As everyone is aware, the world's economic transactions are performed in a variety of different currencies. Currency traders share a generally accepted range of possible exchange rates for different currencies with respect to each other. If a new event occurs that appears to weaken a particular currency, currency traders are liable to buy and sell in a pattern that adjusts the exchange rate to devalue the currency. Economics is a fascinating science (physical scientists often look down upon the social sciences, however, social sciences are simply areas of scientific study that are affected by human behaviour – a fascinating challenge for the researcher). Present law in Canada and the United States says that a banking institution can issue a mortgage while only actually having 10% of the amount of funds needed for the mortgage. The bank borrows the rest of the money from the central bank (a government agency: the Bank of Canada or the Federal Reserve in the USA). The banks are charged a remarkably low interest rate from the central bank and in turn charge YOU a higher interest rate on money they never even had! It is kind of weird that we use the Bohr model of the atom, a man who advocated that quantum mechanics as a theory was complete (despite all its partially explained weirdness - presumably he felt it meshed well with his model of the atom). One of the main experiments to determine the weight of an electron in an educational physics class involves balancing a metal beam partially inside a solenoid (inductor – a big cork screw of tightly wrapped wire). The problem with this is that the force applied by the solenoid is dependent on the type and orientation of the metal balance beam inside core of the solenoid. The other main way to measure the weight of the electron is by Thompson's charge-to-mass ratio experiment. Granting agencies disperse funds allocated for science which usually comes from public and charitable money. Private industry also funds scientific research, however it is typically heavily biased towards creating a new product or process that could be profitable. Unfortunately, granting agencies are also inclined to award funds to research that could lead to a new profitable product or process. This occurs by the very nature of the overly commercialized society in which we live – if scientific research is going to affect humanity for the better it is assumed that science will do so by creating a new invention that will have to become a commercial product – thus biasing scientific funding towards more commercializable endeavours. So a few years ago some computer science students made a new computer program that will automatically create a scientist's research paper complete with text, figures, tables, methods, results etc. The papers are filled up with lots of technical terms and a lot of nonsense. I did a quick job satisfaction survey, check out the plot below. Did you know that scientists regularly require each other to show that their experiments are ‘significant’? This is typically done with a particular test (nerd alert! the t-test) that was developed over 100 years ago in a Guinness beer factory. The test was created long before computers but everyone still uses it despite the fact that if you collect many more samples than you could have by hand, the test will almost certainly give you the ‘significance’ that you’re looking for in your experiments. A colleague of mine made an important point on peer review: it takes so long for a typical peer-reviewed journal paper to get published that by the time it reaches publication, state-of-the-art research is often no longer state-of-the-art. As my colleague points out this long turn around time also forces many researches to repeat the same work of others simply because they don’t have access to the other researcher’s work!